When it comes to fish production many of us are interested in breeding our own fish. What is more exciting than being completely sustainable and not having to buy new fish fingerlings every year? If you are like me you also feel proud to be able to offer such good condition for the fish that you are able to complete the full cycle and hatch your own! The reproduction of ovoviviparous fish involve a sexual penetration and the eggs are developed and kept in the female body until they are ready to hatch. Those are able to give birth to babies that are able to swim and already look like little adults. This category of fish is generally relatively easy to breed. In “colder water” the Gambusia also known as mosquito fish are sometimes kept in little ponds to eat the mosquito larvae. The Oviparous fish represent the large majority. They lay eggs on the bottom or on a support (aquatic plants, roots …) and the egg will hatch after the incubation period. -Fish laying the eggs and taking care of them until they hatch and sometimes even taking care of the young larvae until they are able to live by themselves. The fish tank surface is generally limited and with a higher fish density than in nature. The bottom of the tank is generally flat and it expose the eggs to the parent’s appetite. In aquaponics we generally have a water pump into the fish tank or an overflow with a water pump. This water pump represent a real danger for the eggs and for the young larvae. The young baby fish is generally few millimetres long and extremely fragile. They can be easily sucked by the pump and die. The new born fish larvae are generally not adapted to eat fish food pellet. They have an extremely small mouth opening and generally eat plankton such as microalgae or zooplankton (little crustaceans). In a classic aquaponics fish tank they have very little chances to find the required food needed for their survival. Now that you are exposed to the number of challenges that we can face, let’s see what we can still do in aquaponics. Some fish are spawning on supports such as aquatic plants or tree roots. For those species of fish (gold fish, carps, redfins…) we can present some artificial supports and when ready they will spawn on it. The support I like to use is a simple float with wool strings falling down. The fish will see it as roots and will spawn sticky eggs on it without problem. Once the spawn complete you can collect the support and place it in a special tank that you will have prepared before. This tank will be a simple tank with water from the aquaponics system and exposed to the sun light. Algae will develop and the water will turn green. This will be the perfect larvae tank as the larvae will find a abundance of food. Few Oviparous species of fish are still very easy to grow as they take care of the eggs and of the newborn. Tilapia is one of those and for certain species of tilapia the parents will take care of the eggs by keeping them in their mouth until the babies are big enough to survive and escape from the other fish. In this case you only need to offer some hiding material for the small fish to hide until they get larger. Breeding fish is not always the easier thing to do. If you are beginning in aquaponics I would recommend to first focus on the fish growth and fish welfare. Can you breed your fish in aquaponics? This is what we’re going to see together in today’s video. So in aquaponics, we are growing vegetables, but we are also growing fish, and the fish fingerlings, the baby fish, most of the time, we need to buy them from a hatchery. It’s costly, it’s not very convenient, and what about breeding our fish? It’ll be fantastic if we were able to buy the little fingerlings once and then when the fish grow, we breed them before harvesting the biggest. That would be fantastic. So the question that we’re going to develop today is, is it possible to breed our fish in aquaponics? So first, I would like to say that there are different categories of fish. There are some fish that are able to spawn eggs and some fish that are able to spawn, hatch eggs, so babies, basically, babies that are already the shape of the parents and that are able to live the same life as their parents. So most of the fish that we grow and especially the ones we grow in aquaponics, they’re going to spawn eggs, and that’s the most tricky ones to breed. So the ones that are spawning babies, they are fish that we use mostly in aquariums such as guppies or mollies, all those types of little fish. They can basically spawn babies that are ready to swim. So it’s really nice to grow in aquariums. It’s very exciting to see the babies, but in aquaponics, most of the time, we don’t grow those types of fish. There is one fish that is the mosquitofish which is related to the guppy. It’s actually called Gambusia, and this fish is able to spawn in the water, not really to spawn, but to give birth to some babies in the water that are able to swim straightaway. So those types of fish we can breed them, but in aquaponics, there is no real interest in growing them. The only thing is that they’re going to eat the mosquitos so if you have a pond or somewhere where there is no fish but there is always some water and you want to avoid mosquitos, you can put those fish and they will be able to breed by themselves if they are in good conditions. But now what we are talking about here in this video is the fish that we want to grow in aquaponics that we’re going to be able to use for the whole system so fish that grow to a significant size. I’m not going to develop all the types of fish that we can grow in aquaponics in this video. I already made some videos about it, but today what I really want to talk about is how to – can we breed them, basically? That’s the question. So most of them, they’re going to spawn eggs and then we got two different categories in the category of fish that are spawning eggs. We got the fish that spawn eggs but don’t take care of the eggs. They spawn it and that’s it and some other fish that spawn and then take care of the eggs until they hatch. And even once the eggs hatch, sometimes they’re going to even take care of the babies until they are big enough to survive and to be released and to hide from predators. So you see that there are different categories but most of the fish that we’re going to grow in aquaponics they are the ones that are going to spawn the eggs and not care about the eggs by themselves. Also to start the spawn season, the fish needs to maturate so you know they’re going to – the fish grows when it reaches the adult size to puberty let’s say. The fish is going to start to develop some eggs, and when the eggs are ready, we talk about maturation. The eggs in the fish they get almost mature. So they are not eggs in the fish. Actually, they are ovules, right, because they are not fecunded by the sperm yet. There is no internal fecundation in most of the fish that we grow in aquaponics. So those fish, basically, they’re just going to spawn the egg and the male is going to spawn the sperm. For this to happen, most of the time, the fish need to be in good conditions, no stress, and to be in a natural environment so in a dam and most of the time, the other fish depending on the species, right, they all got different requirements. But some of them need the rainy season when the water temperature decreases, that’s one factor. I mean, there are lots of factors to respect to be able to breed them. And then when they’re going to spawn, they’re just going to leave the eggs there. So in aquaponics, most of the time we are not able to reproduce the condition for the fish to be able to be in good condition to spawn and to have a good fecundation between the male and the female but secondly, the big problem that we have is most of the time, even if they lay eggs, they don’t care about the eggs. I mean, they’re going to spawn and that’s it. And even worse, most of the time, if they find the egg on the bottom, they’re going to eat them so they’re going to eat their own eggs. So you are never going to have any babies in those conditions. The other problem that we have in our aquaponics system is that even if you got the egg that hatched and you got the little larva, so the little fish that is moving at the bottom of the tank, at one point or another, it risks to be sucked by the water pump. In this case, while in the water pump, it’s probably going to be killed and if not, the fish is going to finish in the grow-bed or in your filters. I mean, we are talking about a larva that is a few millimeters long. But the problem is most of the time, they are not going to survive in those conditions. And then the first point that is very tricky as well is that even if they survive, then when the larva, when you got your fish larvae, you need to give them an adapted food, right? Most of the fish when they hatch, they need either microalgae, so you know, the algae that are growing that make the water green, or they need crustaceans, the crustaceans that are eating the algae, you know, the zooplanktons. So you know that in aquaponics we don’t offer those conditions. So that’s why most of the fish that we try to grow in aquaponics, we are not going to be able to breed them. It’s not like in a lake or in aquaculture where we really try to breed them. We put them in specific conditions. We can sometimes work with green water where we let the fish spawn. When the fish are spawned, we can take the eggs and put them in this green water condition where it’s just a tank exposed to the sun where you got a lot of algae and where the larva is able to find all the food they need. So in aquaponics, if you really want to breed your fish, you will have to have different tanks and start to work with those things but the easiest thing is really to get little fish fingerlings. Also some species of fish are easier to grow than others, the ones such as those goldfish. If you give them a good support, they’re going to spawn on the support. Same follows the red fins. I mean, a lot of fish like that, the carps. If you give them a support like normally, they spawn on plants, aquatic plants or roots so if they see something that looks like a plant that has fallen into the water and basically, what I use personally, I use a float and I put some strings of wall, whole strings, and the fish are able to spawn in it so I take the float with the string that is full of eggs and I put it in the tank that is specially designed for this purpose where the water is green, full of algae, which is the perfect food for the little larvae. So you see, there are different things to do and if you just grow your fish in a classic aquaponics system, you are probably not going to have any fingerlings, any breeding in the tank. That said, it depends on the species. If you have a species of fish that take care of their babies, of the eggs and of the babies, such as tilapia, for example, if you are in tropical conditions and you are growing tilapia so there are different types tilapia but most of them take care of the eggs and the babies and even some of them just hatch the eggs inside their mouths. So they blow their mouths and they keep the eggs in their mouth for a while until the baby hatches and even when they hatch, they still take care of the babies. If there is another fish around, the babies are coming back into the mouth and the mother or the father, depending on the species, take care of the babies until they are big enough to take of themselves. So you see, it really depends on the type of fish that you’re going to grow, but really, most of those species, it’s going to be very, very tricky to breed them in aquaponics. So if you are just starting in aquaponics, really I will recommend you to focus on growing the fish instead of breeding the fish. If you are new to this channel, you can subscribe. I release one video per week to help you. And also you can get the free aquaponics training from the description of the video just below, or in the ‘i’ like information in the corner of the video where I give you a lot of information to be able to build your aquaponics system in the best condition and also to maintain it and to grow some sustainable, healthy, and tasty food in your backyard, thanks to aquaponics. So once you get access to the free training, you will arrive to this page. 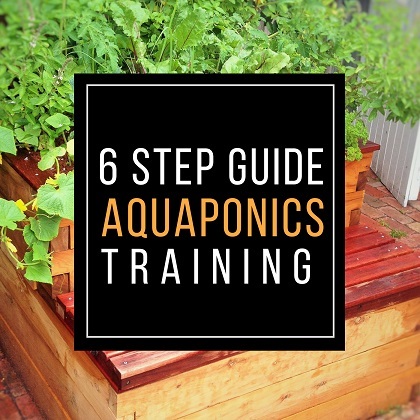 And here you will have a detail of different steps and each time you got a video or some description to really allow you to build some strong knowledge and to know and to learn the basics of aquaponics to avoid any mistakes. So just enter your email address and you will receive access to this training. I hope you enjoyed this video, and I’ll see you in the next one. Bye-bye. Don’t forget your free gift from this screen. You can also leave me a comment below the video. Subscribe to the channel and see my last video. I really hope to see you soon, and I wish you a fantastic success with aquaponics. Have a good crop!